Time to Consign Burning All Burning Effigies to History? The PM called the burning of an effigy of Grenfell Tower on a bonfire as ‘utterly unacceptable,’ but I have to say, as much as it appals me, it does not surprise me. Coming from Belfast, I’m a bit of an old hand at bonfires, and their sometimes destructive power. Maybe it’s something about the fire, wild and ravaging in the darkness, the loss of individual identity in the flickering light, tapping into a deeper, more prehistoric animal in us all? Or maybe, some people just use them as an excuse to drink too much alcohol and behave in a way that, under ordinary circumstances, they probably would not dare to do. When I was a child, I remember collecting for a bonfire in August. In West Belfast, in those days, it was a tradition to set a bonfire alight to mark the anniversary of internment without trial. This suspension of habeas corpus had been authorised by the Northern Irish Prime Minister on the 9th of August 1971. The plan was to lift suspected Irish Republican activists (which they did) but the police and army also managed to scoop up a number of people with no political links at all (not the plan). The end result was anarchy and long-simmering resentment. Thus, I found myself scavenging wood all summer long aged about eight years old, but with no idea why I was doing it. After it was done, the waste ground was still waste ground, and the place smelled of charred wood for ages. But that empty feeling I remember having as I watched our efforts burn was not just disappointment that it was all over. It was because burning pyres as a collective act of political expression really achieved nothing of value but the destruction at its heart. With the bonfire came the obligatory riots, in the main, damaging the areas inhabited by those doing the protesting. Finally, in the late 1980s, this collective insanity was ended by the communities involved and those who took responsibility for leading the way to a different approach to understanding and commemorating history, grievances and ideas. The West Belfast Festival (Féile an Phobail) was born and is now an internationally attended and much-lauded entertainment event. It brings in big names and lots of needed money. My parents still have a few sleepless nights, but now its because Ollie Murs is singing away in the Falls Park, not because the road is burning and the plastic bullets are firing. Catholic areas of Northern Ireland have mostly turned away from the bonfire, but, to borrow a phrase, they haven’t gone away, you know? The 12th of July, our much better known Protestant sister, still revolves around the burning of massive bonfires on the 11th night of July, again ostensibly, to commemorate collective historical moments, these from many hundreds of years ago. But, guess what? 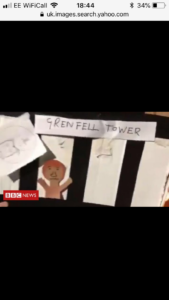 Year in and year out there is controversy, with effigies of the Virgin Mary, Irish flags and photographs of perceived political enemies set to flame. With the rise in social media and streaming videos, we have also seen instances of hate speech chanted around the fires, and damage and destruction from poorly constructed, often massive, bonfires. So, no, the disgusting actions of those who burnt Grenfell Tower in effigy did not really surprise me at all. Stanley Milgram, the social psychologist, suggested in his famous obedience experiments that it’s not just the deranged and deficient who are capable of terrible atrocities and inhumanities. Given the right social context, with and the incendiary formula of diffusion of responsibility and the melting of norms and values once shared and taken for granted, it’s you, and it’s me. I watched middle-class men and women glibly hoist an effigy of Guy Fawkes to the top of a dry bonfire at the edge of the cricket club close to my London home on Saturday morning. I don’t know everything about the Gunpowder Plot, but I know that the real Guy Fawkes was tortured horrifically before he was put to death brutally. It gave me a chill. And it made me think, even before the news of the Grenfell Tower effigy, that there’s a better way to celebrate our liberty, our historic liberalism, our victories and our indignations than burning bonfires. My nine-year son asked me what was going on and I gave him a sanitised, and potted summary of the history of the country of his birth. My little Englishman held my hand, and I didn’t let him go. History is best understood, not repeated in my experience. Crook’s Hollow: Dark, claustrophobic, rural noir. 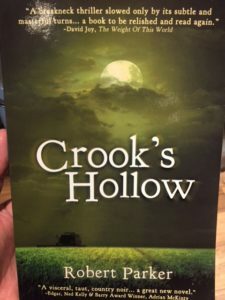 Crook’s Hollow is a countryside noir that’s dark, claustrophobic and with more turns and unforeseen twists than the tangled roots of a rural family tree. The first of its kind I’ve read and a stunning stand alone from the reliably talented Robert Parker. We meet the protagonist Thor Loxley at the business end of a moving combine harvester and it’s no plot spoiler to say that Rob Parker is an unforgiving god to his lead man, for whom things go steadily from bad to worse. Simple in its premise (Thor wants to know who’s out to kill him and why), the author has created in Crook’s Hollow a lesson in how to craft a tight story on a small canvas that nonetheless keeps the action coming and the reader guessing right to the end. Parker’s a dab hand at summoning time and place in sufficient detail to allow the reader to immediately immerse in his world, but never at the expense of keeping the heart of the story beating. His characters are formed with clean outlines and they are instantly with us, no name confusion or need to flick back and reintroduce. Given the fairly wide cast, it’s an achievement he should be proud of, and one that more seasoned writers I’ve read of late have some homework to catch up on. Personally, I love Parker’s turn of phrase, use of similes and lovely metaphors. Favourites include a day “labouring along” in one of those “maternity ward pauses”, and “bulging clouds”. Oh, yeah, expect rain. Lots of rain. But also get ready for a corkscrew twist, several in fact. Another of Parker’s trademark skills at work. But I’ll stop at that, in case I spoil this for you! A slim, trim thriller, the Carolina Reaper of crime novels, this little fella ranks tops on the Scoville scale of entertainment for countryside noir. I recently attended a CWA talk given by Leigh Russell, author of the successful Geraldine Steel crime thriller series amongst others. Leigh was speaking about how to sell a million books. So I was there, front row, with fellow Endeavour Media author and mate Paul Sinclair. Leigh’s best advice was to buy a bookshop, boom boom. Seriously, though, she spoke well, wise words from a woman who knows; get a good publisher, keep working and be lucky. And be receptive to being lucky, by at least partly making your own luck via the second suggestion above. Questions were taken and I had a few. Foremost being should I change my name to Lee or Leigh, what with her success and Lee Child’s Jack Reacher series, it sounded liked a good start. Weirdly enough she didn’t entirely disagree. My next question was about ideas, or more specifically, prioritising them. I’m big on ideas but small (er) on time to write, scribbling not being my full-time profession as yet (I write this on Saturday morning after early breakfast but before the kids’ sporting enrichments). ‘Lucky you,’ replied Leigh, ‘can I have a few?’ A humble question indeed from a woman who has written twenty-odd best sellers. But perhaps not such an absurd proposal. Cut back to the previous Sunday and I was enjoying a cold beer in the warm sunshine (I do other things apart from beer drinking, but I sneak it in when I can). We were at an annual family reunion on my wife’s side, and I got speaking to a cousin of a cousin, Amanda. Talk turned from novel writing to creativity in general and to the genesis of ideas. Amanda said ideas were butterflies from the universe, we don’t actually own them, they find us, choose us. Sometimes they alight on our consciousness. If we welcome and make use of them, we can watch these beauties grow, but if we don’t… Off they fly, they land on someone else, and though that person might see its colours and contours a bit differently from you, it’s essentially the same creative energy, but now it’s theirs to grow. Now, in case you’re wondering, Amanda wasn’t puffing the magic dragon, not that kind of party really. I left her chatting to my wife’s sister who’s an artist that can hold her own when it comes to selling original interpretations door to door (often it’s the moon that’s to blame I’m told). Scoff as I did, what Amanda said stuck, and I couldn’t let it go. If you write books, or even if you are planning to, I bet you know what I mean. That feeling, that absurd vulnerability that joins you like a shadow at your desk. It whispers that somehow, if you don’t get cracking, if you don’t finish up that all-important first draft, then someone, somewhere will finish it before you. Irrational as it is, you honestly fear “they” might write your book first, and it will be lost to you even as you struggle to complete it. Or, maybe, that’s just me? But in case your thinking that I’m puffing the magic dragon, listen to this. I met a guy once who did moderately well with his first crime thriller, but told me that his original book idea, a great idea involving serial murder with a religious twist, literally appeared on the shelves as he finally got round to writing it. I had an idea, a fleeting image in my mind some years ago, but I knew then that it was a super opening for a novel and a great set up. I wrote a very rough first few pages but let it die, or, perhaps, let it fly away. What became of this? Well, a few years later I read something alarmingly similar but published by another crime writer. He did well off it too. I can show you my dated drafts, you will probably recognise the premise. Losing the butterfly is not the only way to lose your ideas. A mate of mine, whose father, a very famous film and screen actor who sadly has since passed away, once told me that his old man had an awesome idea for a screenplay. He sent it to someone in Hollywood, never heard back, and let it go. He saw his movie idea advertised on the side of a London bus a couple of years down the line. You have probably watched the film, most people did. Try blaming that on the moon. Intellectual theft aside, more often than not we lose great ideas simply because we fail to nurture them and when you’re a novelist, that means writing them. This week I laid down the first 2000 words of a new novel, and a new series if my feeling is right. And what a feeling. But earlier in the week, while travelling to work I wrote a thousand words of a different, stand-alone, that came to me out of the blue. Like a butterfly landing on my hand, you might say. Both voices were strong and clear and I want to breathe life into each. Leigh said that she once wrote two books a year while still a teacher and it almost finished her. But she didn’t say she regretted it. I have no idea whether I can do the same, but I’m going to try. God knows I’ve wasted enough time making excuses for not writing in the past. And I know for a fact that hard graft rarely leaves you feeling cheated. The real regrets in this life are the opportunities, experiences and great ideas that we allowed to fly away. 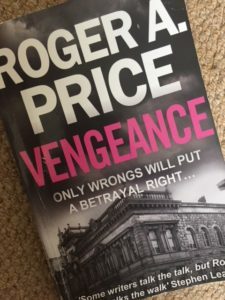 Vengeance, Roger A Price’s second book in his Detective Vinnie Palmer series, follows on from the tearaway success Nemesis. Liked Nemesis? You’ll love this. Palmer’s back on the job, but I don’t envy him. When the first few chapters serve up a pig’s heart on a paper plate, a murder, arson and the suggestion of political intrigue you know that one of the very best of British crime thriller writers is going to take you on a car chase of a story. Buckle in; it’s breakneck from start to finish, with a twisting, deftly weaved plot that qualifies Vengeance for the sometimes overused accolade of ‘unputdownable’. Roger braids different story lines with a skill that makes it seem easy, and gets the balance between gritty, violent realism and old school chivalry spot on. His attention to police procedural detail adds a ballast of authenticity to the whole story and his creative reach, taking us from the regional details of the England’s North West to the troubled history of Northern Ireland, suggests a writer really starting to flex his muscle. Looking forward to re-joining the Vinnie and Christine (for goodness sake man kiss her!) in book three. Two successes in a row, and like Vinnie Palmer, I don’t believe in coincidences. Roger rocks. To read is human. To review? Well, it gives you wings. And more often than not, it also puts a smile on an author’s face. Well, most of the time. It can depend on what’s written of course. And how many precious stars have been judged worth. An old friend of mine who is doing very well for herself in the YA fiction world was understandably aggrieved to have been given a low star judgement. Never a welcome visitor, but made all the worse that this was before the book had even been released! That was harsh, no doubt about it. But the reality is that when you put you work out there, you are at the mercy of the judgements of others, most of them public. These days being a troll is no longer something people achieve by playing Dungeons and Dragons. I remember putting a couple of ideas together a few years ago for the #PitchCB agent try organised by Curtis Brown. While reading fellow author’s attempts, I noted that there were people who lurked in the shadows of Twitter with the express purpose of putting the ideas of aspiring writers down, like it was a new sport. Tough audience as Homer said. Still, I encourage you; please do review. If only to add a small sentence and an honest star rating, it really matters. Why? Not just because it makes the heart of a fresher author skip a little to see that another person has not just read but taken the time to comment on their work. Though of course, that matters to us. No, I think it is more important than that. It says something vital about the art of storytelling and the place of the reader in that little act of magic. Stories, as the old saying goes, begin with the writer and end with the reader. Seamus Heaney once said that a poem ceased to belong to him after he’d published it and sent it out into the world. It became a shared thing, it multiplied in the minds of many and like poetry, a novel takes on a published life of its own. I have a mate who keeps sending me photos of people he believes look exactly like my two main characters Sheen and Aoife McCusker. More power to him, but they are his characters now, as he has imagined them, and I love that fact that they are alive for him. I don’t think I’m very big in Japan, but I’m doing alright in Australia. Had a bumper week in my own modest terms while the e-book was on discount and promoted through BookBub. And… I have two reviews! One is a five star, the other is a two. So, numerically, it all balances out. Have to say though; the lady who hit me with that two star slap has a special place in my heart. Margaret ‘Couldn’t finish it’ (which puts her in fair old company; my own Mum has politely demurred. The grit, noir and blood on the blade are not for everyone). Still. Margaret, I want to thank you, because even though you put the book down, you took the time to review, you felt that you had to have your say. And that means it touched you, maybe in a way that neither of us a likely to fully grasp. Or, maybe, it just wasn’t your fancy. But one thing I do know, it’s your fancy now. And while I love to entertain, take joy when a reader enjoys, the idea that my story is out there, reimagined and reproduced is the greatest thrill of them all. So to Margaret, and to all those who have taken the time, this one is for you. Want to join the party? ‘Mon in, if you’ve read it, review it! After all dear reader, you too are the author now.